Our radio decoding service covers many of the car stereo & Sat Nav units fitted to VOLKSWAGEN (VW) cars & trucks. Codes for Stereo and Sat Nav models fitted to the VW Golf, Beetle, Lupo, VW Caddy, Volkswagen Passat, Polo etc. Codes for VW factory-fitted radios require upto 24 hours to supply as they cannot be 'calculated' and must be obtained from a reliable VAG partner. It also means that the cost is a little higher than our standard price, at £14.95. The 14-digit serial number will usually be similar to VWZ1Z2E7720494, except for the older units. If there are several numbers on the radio and you are unsure which is the part number, serial number etc., list them all in the 'Additional Details' section at the bottom of the form and we'll check. For security reasons we require the 17-digit VIN number of your vehicle, and the Radio/Sat-Nav must be the one factory-fitted to your car. 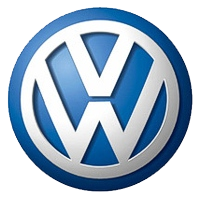 Be very careful before buying second-hand units - suspicious units are flagged on VW's system. However, if you have the VIN number of the original vehicle then we can probably help. Labels applied to the case of the radio may overlap the back and top, or top and side panels. If such a label is torn along the line where the panels meet, it might indicate the radio has been previously repaired and the code reset. You will need to pull the radio from the dashboard to read the numbers we need from its chassis - this will be on a printed label and/or engraved on the metal case. Some units are extracted using 'keys' - you will see two small slots each side of the faciaplate, or sometimes two slots top and bottom. Don't be tempted to try removing the radio another way or force it as you may damage the surrounding dashboard trim. 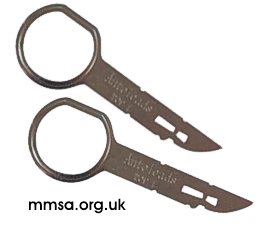 The keys make it easy - you can find them in motoring stores or online (there are 4 or 5 different types so ensure you buy the correct ones). Some VW units are extracted by first removing the trimplate to reveal two or more torx head screws - you will need a torx T20 screwdriver to undo them, then pull the radio out.